Most people resist change. As a consequence, the main job of an innovator will be to drive adoption, by convincing people and organizations to disrupt their routines. 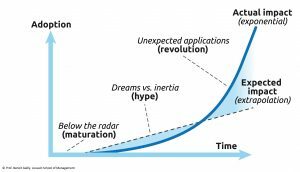 Driving adoption means demonstrating to key stakeholders that disrupting the status quo is worth it and that adopting the innovation will bring significant perceived benefits. Driving adoption also means convincing key stakeholders that adopting new routines will be neither too difficult nor too risky, and that they and others can easily make it happen. (Book) Godin, S. (2003). Purple cow: Transform your business by being remarkable. Penguin. (Book) Kotter, J. P., & Rathgeber, H. (2006). Our iceberg is melting: Changing and succeeding under any conditions. Macmillan. (Book) Lewin, K. (2013). A Dynamic Theory of personality-Selected papers. Read Books Ltd.
(Book) Perez, C. (2003). Technological revolutions and financial capital. Edward Elgar Publishing. (Video) How to Deal with Resistance to Change | Heather Stagl | TEDxGeorgiaStateU. (Article) Becker, M.C. (2004). Organizational routines: a review of the literature. Industrial and Corporate Change, 13(4), 643-678. (Article) Cohen, M. D., Burkhart, R., Dosi, G., Egidi, M., Marengo, L., Warglien, M., & Winter, S. (1996). Routines and other recurring action patterns of organizations: contemporary research issues. Industrial and Corporate Change, 5(3), 653-698. (Article) Felin, T., & Foss, N. J. (2009). Organizational routines and capabilities: Historical drift and a course-correction toward microfoundations. Scandinavian Journal of Management, 25(2), 157-167. (Article) Ford, J. D., Ford, L. W., & D’Amelio, A. (2008). Resistance to change: The rest of the story. Academy of Management Review, 33(2), 362-377. (Article) Ford, J. D., & Ford, L. W. (2009). Decoding resistance to change. Harvard Business Review, 87(4), 99-103. (Article) Frambach, R. T., & Schillewaert, N. (2002). Organizational innovation adoption: A multi-level framework of determinants and opportunities for future research. Journal of Business Research, 55(2), 163-176. (Article) Hannan, M. T., & Freeman, J. (1984). 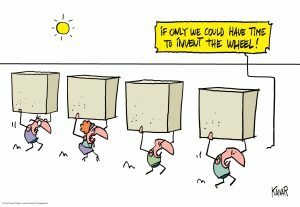 Structural inertia and organizational change. American Sociological Review, 149-164. (Article) Heidenreich, S., & Spieth, P. (2013). Why innovations fail—The case of passive and active innovation resistance. International Journal of Innovation Management, 17(05), 1350021. (Article) Marcati, A., Guido, G., & Peluso, A. M. (2008). The role of SME entrepreneurs’ innovativeness and personality in the adoption of innovations. Research Policy, 37(9), 1579-1590. (Article) Pardo del Val, M., & Martínez Fuentes, C. (2003). Resistance to change: a literature review and empirical study. Management Decision, 41(2), 148-155. (Article) Pentland, B. T., & Feldman, M. S. (2005). Organizational routines as a unit of analysis. Industrial and Corporate Change, 14(5), 793-815. (Article) Sydow, J., Schreyögg, G., & Koch, J. (2009). Organizational path dependence: Opening the black box. Academy of Management Review, 34(4), 689-709. (Article) Van de Ven, A. H., & Poole, M. S. (1995). Explaining development and change in organizations. Academy of Management Review, 20(3), 510-540. (Article) Vuori, T., & Huy, Q. (2016). ‘Distributed Attention and Shared Emotions in the Innovation Process: How Nokia Lost the Smartphone Battle’. Administrative Science Quarterly, 61, 1-43. (Book) Gladwell, M. (2006). The tipping point: How little things can make a big difference. Little, Brown. (Book) Moore, G. A. (1991) Crossing the Chasm: Marketing and selling high-tech goods to mainstream customers. 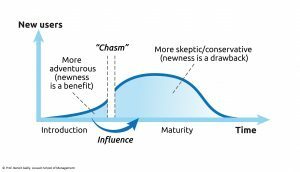 (Video) Bath, W. Crossing the Chasm – Disruptive Innovation – Technology Adoption Life Cycle. (Article) Antonides, G., Bas Amesz, H., & Hulscher, I. C. (1999). Adoption of payment systems in ten countries-a case study of diffusion of innovations. European Journal of Marketing, 33(11/12), 1123-1135. (Article) Bakker, S. (2010) The car industry and the blow-out of the hydrogen hype. Energy Policy, vol. 38, no. 11, pp. 6540-6544. (Article) Cialdini, R.B., & Goldstein, N.J. (2004) Social influence: Compliance and conformity. Annu. Rev. Psychol., 55, 591-621. (Article) Eerkens, Jelmer W., and Carl P. Lipo. “A tale of two technologies: Prehistoric diffusion of pottery innovations among hunter-gatherers.” Journal of Anthropological Archaeology 35 (2014): 23-31. (Article) Feiereisen, S., Wong, V., & Broderick, A. J. (2013). Is a Picture Always Worth a Thousand Words? The Impact of Presentation Formats in Consumers’ Early Evaluations of Really New Products (RNP s). Journal of Product Innovation Management, 30, 159-173. (Article) Gollier, C. (2001). “Should we beware of the precautionary principle?” Economic Policy, 33, 303-327. (Article) Hoeffler, S. (2003). Measuring preferences for really new products. Journal of Marketing Research, 40(4), 406-420. (Article) Jeyaraj, A., Rottman, J. W., & Lacity, M. C. (2006). A review of the predictors, linkages, and biases in IT innovation adoption research. Journal of Information Technology, 21(1), 1-23. (Article) Stock, R., von Hippel, E., & Gillert, N. (2016). ‘Impacts of personality traits on consumer innovation success’. Research Policy, 45, 757-769. (Article) Venkatesh, V., & Davis, F. D. (2000). A theoretical extension of the technology acceptance model: Four longitudinal field studies. Management Science, 46(2), 186-204. (Article) Venkatesh, V., Thong, J. Y., & Xu, X. (2012). Consumer acceptance and use of information technology: extending the unified theory of acceptance and use of technology. MIS quarterly, 36(1), 157-178. (Book) Abrahamson, E. (2004). Change without pain: How managers can overcome initiative overload, organizational chaos, and employee burnout. Harvard Business Press. (Book) Eagleman, D., & Brandt, A. (2017). The Runaway Species: How human creativity remakes the world. Catapult. (Book) Fagerberg, J. (2005) The Oxford Handbook of Innovation, Oxford University Press. (Book) Norman, D. A. (2013). The design of everyday things: Revised and expanded edition. Basic books. (Book) Rogers, E. M. (2010). Diffusion of innovations. Simon and Schuster. (Book) Dawkins, R. (2016). The selfish gene. Oxford university press. (Article) Adner, R. (2006). Match your innovation strategy to your innovation ecosystem. Harvard Business Review, 84(4), 98. (Article) Adner, R., & Kapoor, R. (2016). Right Tech, Wrong Time. Harvard Business Review, 94(11), 60-67. (Article) Adner, R., & Kapoor, R. (2016). 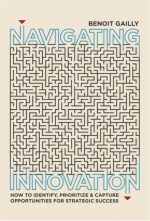 Innovation ecosystems and the pace of substitution: Re‐examining technology S‐curves. Strategic Management Journal, 37(4), 625-648. (Article) Arts, J. W., Frambach, R.T., & Bijmolt, T.H. (2011). Generalizations on consumer innovation adoption: A meta-analysis on drivers of intention and behavior. International Journal of Research in Marketing, 28(2), 134-144. (Article) Bakker, S., van Lente, H., & Meeus, M. T. (2012). Dominance in the prototyping phase—The case of hydrogen passenger cars. Research Policy, 41(5), 871-883. (Article) Bass, F.M. (2004). Comments on “a new product growth for model consumer durables the bass model”. Management Science, 50(12_supplement), 1833-1840. (Article) Chakravorti, B. (2004). The new rules for bringing innovations to market. Harvard Business Review, 82(3), 58-67. (Article) Chiesa, V., & Frattini, F. (2011). Commercializing technological innovation: Learning from failures in high‐tech markets. Journal of Product Innovation Management, 28(4), 437-454. (Article) Coeurderoy, R., Guilmot, N., & Vas, A. (2014). Explaining factors affecting technological change adoption: A survival analysis of an information system implementation. Management Decision, 52(6), 1082-1100. (Article) Damanpour, F., & Schneider, M. (2008). Characteristics of innovation and innovation adoption in public organizations: Assessing the role of managers. Journal of Public Administration Research and Theory, 19(3), 495-522. (Article) David, P.A. (1985). Clio and the Economics of QWERTY. The American Economic Review, 75(2), 332-337. (Article) Dobusch, L., & Schüßler, E. (2012). Theorizing path dependence: a review of positive feedback mechanisms in technology markets, regional clusters, and organizations. Industrial and Corporate Change, 22(3), 617-647. (Article) Geels, Frank W., and Johan Schot. “Typology of sociotechnical transition pathways.” Research Policy 36.3 (2007): 399-417. (Article) Goldenberg, J., Han, S., Lehmann, D. R., & Hong, J. W. (2009). The role of hubs in the adoption process. Journal of Marketing, 73(2), 1-13. (Article) Greenhalgh, T., Robert, G., Macfarlane, F., Bate, P., & Kyriakidou, O. (2004). ‘Diffusion of Innovations in Service Organizations: Systematic Review and Recommendations’. The Milbank Quarterly, 82, 581-629. (Article) Griliches, Z. (1957). Hybrid corn: An exploration in the economics of technological change. Econometrica, Journal of the Econometric Society, 501-522. (Article) Hameed, M. A., & Counsell, S. (2014). Establishing relationships between innovation characteristics and IT innovation adoption in organisations: A meta-analysis approach. International Journal of Innovation Management, 18(01), 1450007. (Article) Leonard, T. C., Richard H. Thaler, Cass R. Sunstein, (2008). Nudge: Improving decisions about health, wealth, and happiness. Constitutional Political Economy, 19(4), 356-360. (Article) Lounsbury, M. (2007). A tale of two cities: Competing logics and practice variation in the professionalizing of mutual funds. Academy of Management Journal, 50(2), 289-307. (Article) Reinders, M. J., Frambach, R. T., & Schoormans, J. P. (2010). Using product bundling to facilitate the adoption process of radical innovations. Journal of Product Innovation Management, 27(7), 1127-1140. (Article) Seligman, L. (2006). Sensemaking throughout adoption and the innovation-decision process. European Journal of Innovation Management, 9(1), 108-120. (Article) Soh, P.H. (2010). Network patterns and competitive advantage before the emergence of a dominant design. Strategic Management Journal, 31(4), 438-461. (Article) Vergne, J. P., & Durand, R. (2010). The missing link between the theory and empirics of path dependence: conceptual clarification, testability issue, and methodological implications. Journal of Management Studies, 47(4), 736-759.